I absolutely love desserts which have bananas in them. Especially so if I use the local bananas called "pisang emas" (direct translation is golden bananas) found in this part of the world. They are small in size and when ripen develops black spots on its skin. Once you peel away the skin, you are immediately surrounded by a whiff of delicious sweet banana aroma. The fruit itself is a deep dark yellow tinged with a light brown colour. 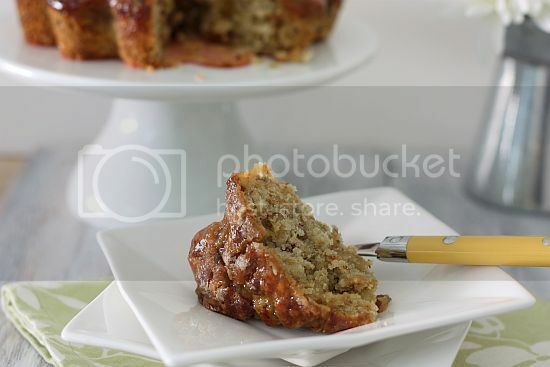 I personally feel that this particular banana accentuates the flavours of desserts and baked goodies. 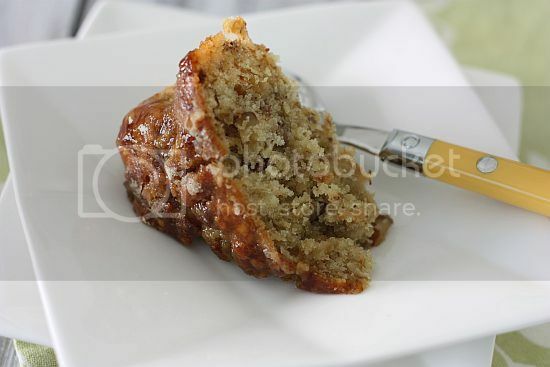 I could not help myself in trying out this recipe especially so when it has a butterscotch sauce poured into the cake. 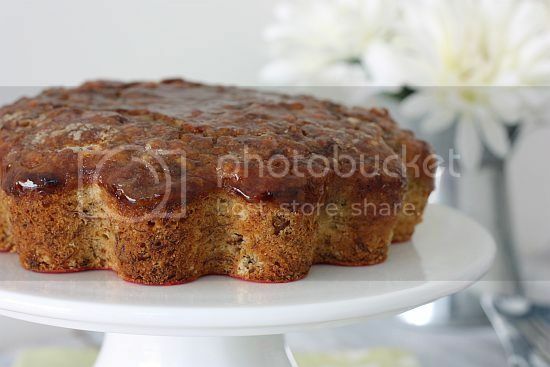 It so reminds me of a sticky date cake, warm, comforting and so delicious. This particular cake did not disappoint me at all. In fact I still have a couple of slices in my freezer waiting for my banana cake cravings to creep up on me! 1) Preheat oven to 180C. Grease a 20cm round cake tin and line base with parchment paper. 2) Rub the butter into the flour until the mixture resembles fine breadcrumbs. Add the sugar, raisins and chopped walnuts. 3) Whisk the bananas and eggs together until very thick and creamy, then fold in the dry ingredients and vanilla extract. 4) Transfer to cake tin and bake in the oven for an hour to an hour 15 minutes. 6) As soon as cake is ready, remove from oven. Take a skewer and pierce all over the cake. Then pour the butterscotch over the cake. Leave to cool in the tin. Jo, this looks like something I can adapt for my bottle of dulce de leche! this look fantastic! (: soft and fluffy texture of the cake with butterscotch. im sure it taste heavenly!! Nice! Looking forward to trying this at home! Hi Shirley, yes you could use DDL in placement of the butterscotch and I bet it would be equally yummy! this looks awesomely good Jo! can't wait for the next batch of bananas! Jo, this looks moist and delicious. Love the shape of the cake too! This looks so lovely. Any left for me? This looks really good - I really like the shape of your cake! Was it a specially shaped tin? 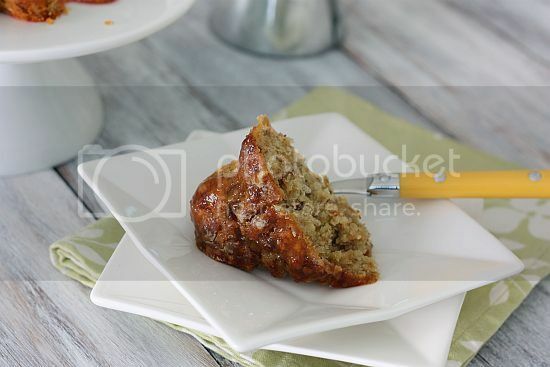 Jo, this is such a delicious looking banana cake. The butterscotch sauce makes it looks ACE! 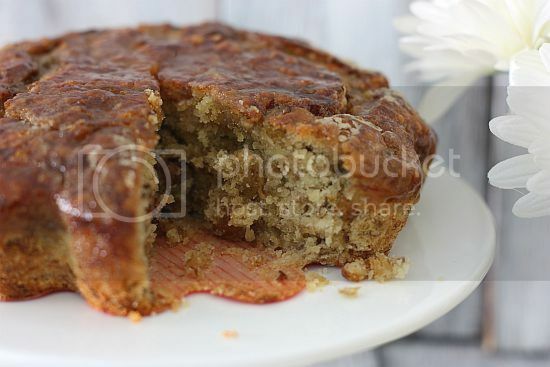 Lovely moist and tasty looking cake no wonder you love to eat it. Looks gorgeous Jo! It's hard to resist anything with bananas, the smell alone makes you drool! Hi all, thanks for dropping by and leaving me your comments. Hi Lubna, I too was thinking about you couple of weeks ago. Hope all's well with family and baby.